Dimensions (HxWxD): .75" x .25" x .20"
This gorgeous .75 inch long, 4.58 carat AAA Burmese Phenacite with Fairy Rings has beautiful clarity and brilliance with a lovely golden hue. It has a beautifully faceted hexagonal shaft and a magnificent termination tip. This is a lovely natural, untreated, uncut gemstone quality specimen of an extremely rare variety of phenacite. The stones we have for purchase are from Burma, they are small hexagonal cylinders of stone, typical of phenacite, with one end having facets. They are basically transparent with a golden glow and clarity and light emanates from them. It is harder than ever to find these treasures, we are lucky to have held back a big bag full from a purchase years back. At first glance, they are very unassuming, until you really give a good look, see the light field around and within them, and experience them first hand. 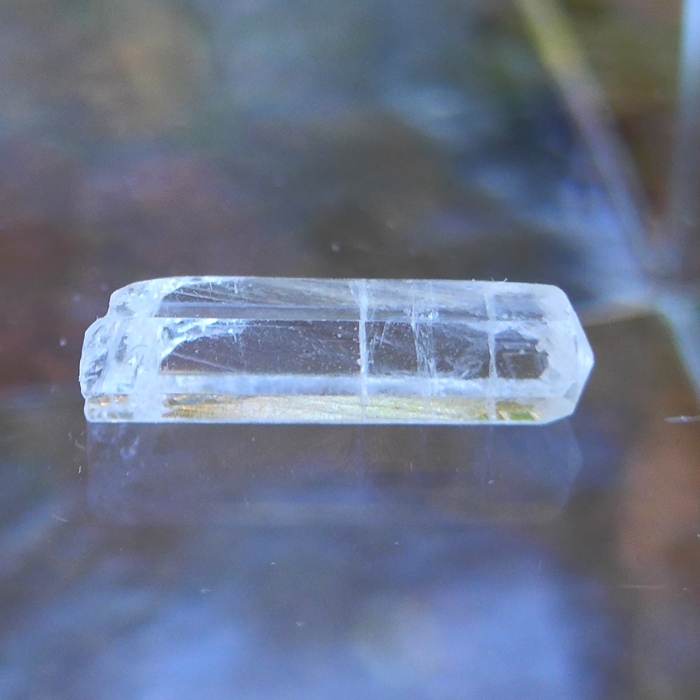 They are slender bits of stone which can easily fit into your hand, can be placed onto the various chakras of someone on a table or can be carried upon the body in a medicine bag, or pocket. Curtis and I have found that Burmese phenacite has an extremely intense energy to it, warming the body, stimulating the chakras, and strengthening the flow of kundalini energy throughout the system. 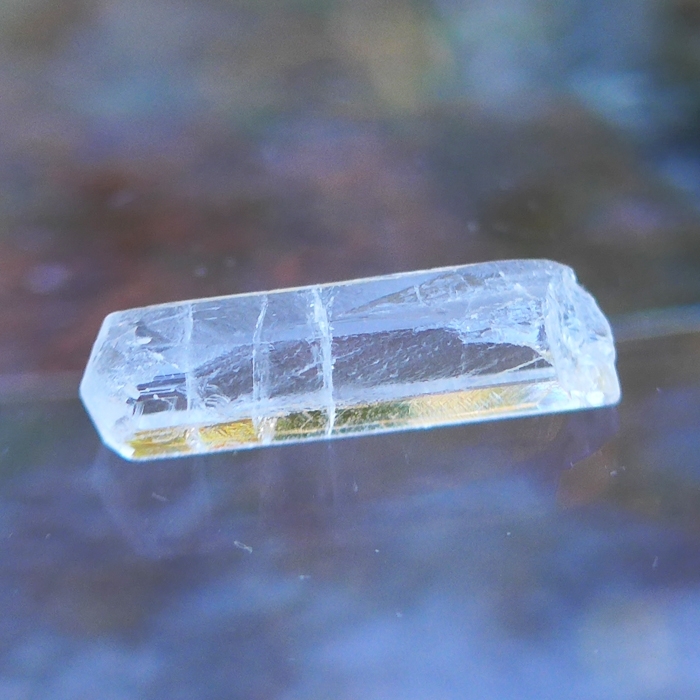 Phenacite is an extremely hard, light gemmy form of beryllium silicate crystal, exhibiting a bright vitreous luster, found primarily in Brazil, Italy, Russia and Burma. Phenacite is much harder and much lighter than quartz crystal, appearing most often in hexagonal rods, like this gorgeous gemstone. Gemologists prize the Burmese phenacite above other types, because it is rare, and a Burmese phenacite gemstone of this type is definitely a mineralogical collector's item, as well as a Lightworker's dream come true, because of the unique energy signature of this type of phenacite. Lightworkers, meditators and healers prize Burmese phenacite because of all the phenacite on the market, Burmese phenacite has the highest frequency energy signature, and the greatest ability to stimulate the flow of energy throughout body, mind and aura. In our energy work with several phenacites from around the world, one thing is clear-phenacite moves awareness to the Higher Mind centers & assists us in connecting with Divine Source. We (Jane and Curtis) were first introduced to the wonders of phenacite on a business trip to meet with a new supplier. He put the small stones in Curtis' hand and said "you need these". 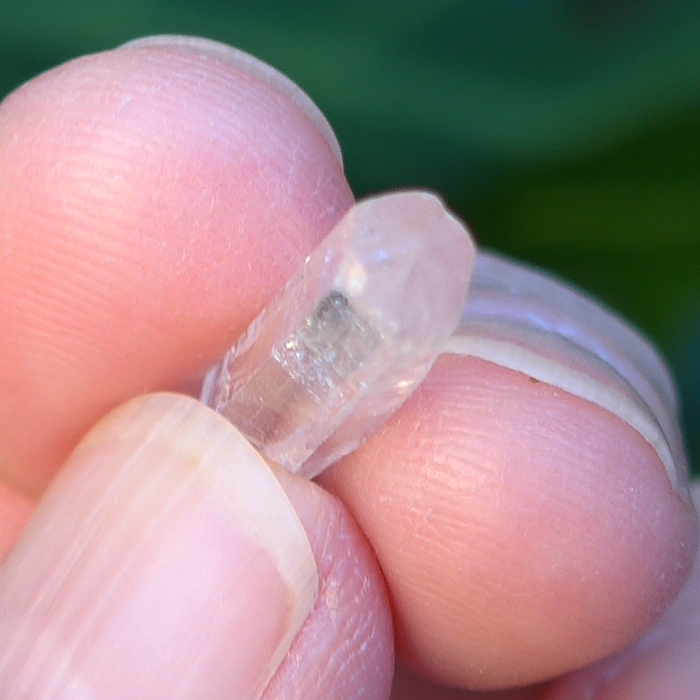 Well, I was skeptical, as I found it hard to understand what such small, yet clear and beautiful stones would do for us, so I held one in my left hand as we drove the three hour drive home. Well!!! Within five minutes of holding the stone, I became very excited and told Curtis (he was driving), that all of our healer friends need this stone, that anyone who works with people doing more than one session a day, could really benefit from holding this stone between treatments. I felt an instant connection with a golden white grid of light, (and I am not normally the one in this household who does grid work) and such clarity all around me. I literally felt energy connecting me to my third eye & crown chakras which set a field of clear and resonant energy all around me. I felt as if I'd been transported to a clear room of light, with no interfering energies of any kind, a simple radiant Light of the Highest Vibration I have yet experienced. It wasn't peaceful exactly, although it did make me feel good, feel grounded, connected to Source and kinetically alive in a brilliant spacial enclosure. It was as if our car, turned into a temple dedicated to the Father/Mother Source and I had just had a drink from their well of crystalline pure waters connecting me in every direction with knowing, with being, with total Love & Acceptance. 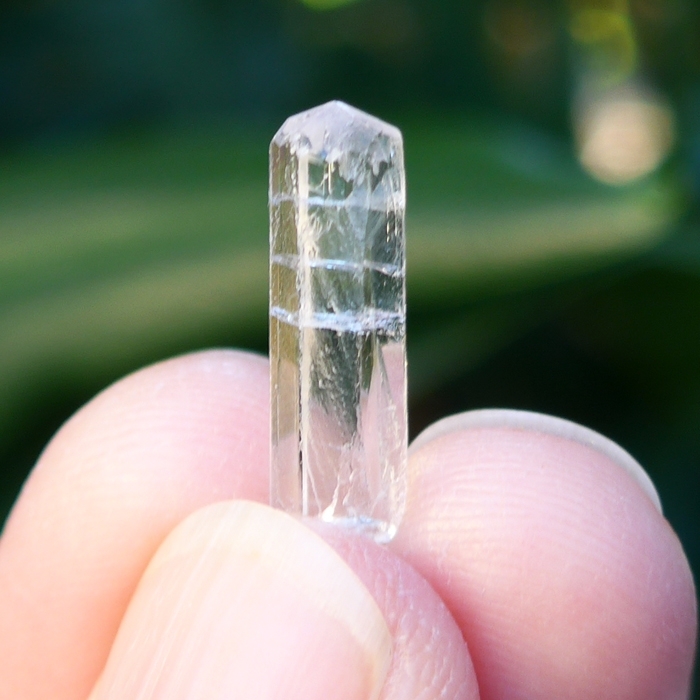 Of course, when we returned home, I did look up phenacite in one of our crystal resource guides and found it was associated with the third eye and facilitates deep meditation, encouraging deeper intuition. Phenacite carries a strong energy of love and bright light. Note: Weight above is shipping weight. Actual weight is 4.58 carats or .916 grams.